At the top of our fleet the Bentley Spur hire car is a gorgeous option for those looking to seat four passengers and fit three medium pieces of luggage. The exquisite design guarantees that you’ll feel like royalty when you arrive at your destination in this beautiful vehicle. The sleek interior design compliments the beautiful exterior, and comfort is the main focus. You and your passengers will experience plenty of leg room, along with comforting plush seating. The cargo space provides plenty of space for your luggage, making travel and packing a breeze. Handling is a dream in this Bentley Flying Spur hire car, so you’ll enjoy your ride, no matter the distance. The turbocharged engine provides a bit of spark for your journey and handles effortlessly on any road. You will enjoy satellite radio on your journey, as well as an 8-inch, high definition display at the front of the vehicle. When you work with our chauffeur service, you’ll never have to question the quality, cleanliness, or condition of your rental. We clean and detail each car before making it available to you, to ensure that you’re always satisfied with your hire. 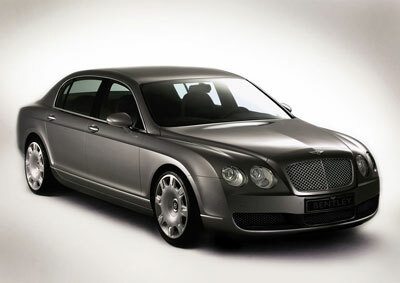 If you want to ride in the lap of luxury, the Bentley Flying Spur is a great option for your chauffeur hire. Let our Bentley Flying Spur chauffeurs take you from A to B with Prestige Chauffeurs top of the line Bentley Flying Spur hire car services today.